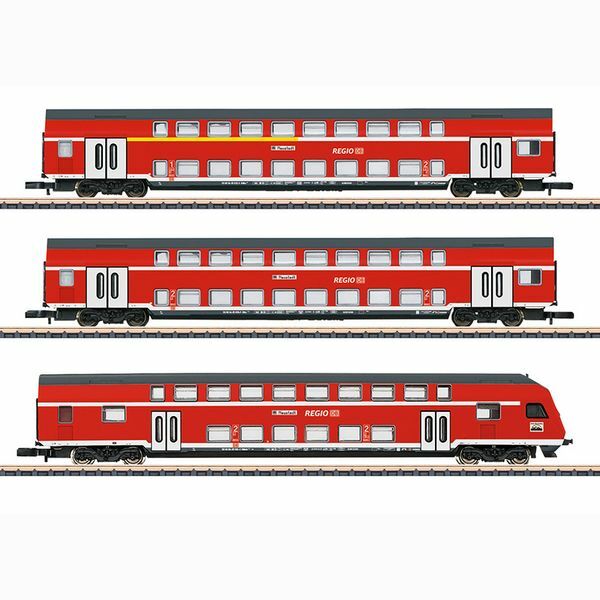 Marklin 87297 DB Regio AG Bi-Level Car Set Prototype: One (1) type DBbzfa 761 bi-level cab control car, 2nd class, one (1) type DBza 751 bi-level car, 2nd class, one (1) type DABza 756.0 bi-level car, 1st/2nd class, all painted and lettered for the DB Regio AG. The cars looks as they did in Era V, around 2002 on the Höllental Line. Model:The two (2) bi-level cars and one (1) bi-level cab control car are correctly and finely painted and lettered for the DB Regio AG. The bi-level cab control car has triple warm white headlights / dual red marker lights that are LEDs and that change over with the direction of travel. All of the wheels on the cars are black nickel-plated. Total length over the buffers approximately 370 mm / 14-9/16". The locomotive to go with this car set can be found under item number 88438.